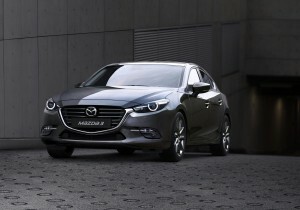 The new Mazda3 is being described as smarter, sharper and more sophisticated than the model it replaces. This is the new Mazda3 for 2017 which comes with a raft of new technology and styling enhancements as well as a revised cabin. There are four spec levels with prices starting at £17,595 OTR and there’s lots of new kit including the firm’s vehicle dynamics technology which owners will get to enjoy when it goes on sale in October. The Mazda3 also features G-Vectoring Control which works along the lines of other carmakers’ torque vectoring function so it varies the engine’s torque output to boost stability and the comfort of passengers in line with the car’s steering angle. To help reduce the noisy start-up noise of the diesel engines, there’s a sound smothering device to help reduce the knocking noise and it also boosts the engines refinement, particularly when under full load. It is also effective at low speeds too. Of the engines, the diesel choices include a 1.5litre unit producing 105 bhp and 2.2 L Skyactiv unit that produces 150 bhp with an excellent 2.0litre petrol engine producing 165 bhp or 120 bhp. The Mazda3 also has improved road insulation so the cabin is a very quiet place to be and the suspension has also been improved to help deliver an improved ride comfort. The new Mazda3 is slightly dearer than the model it replaces with upgraded materials in the cabin and doors and a new steering wheel design. There’s also an electric parking brake introduced and the options list offers head-up display and adaptive LED headlights along with a choice of eight colours for the body. The model it replaces has been an excellent product and the new model will be available early next year – with more than 5 million models sold around the world the revamped 3 for Mazda will surely build on that sales success. This entry was posted in Car Leasing, Cars, Family Car, New Cars and tagged Mazda3 by Steve Lumley. Bookmark the permalink.